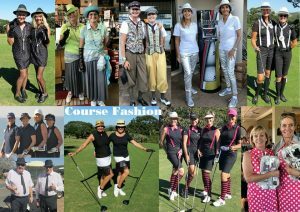 The 2018 Ladies Classic was another roaring success, competitive, fashionable and 3 stunning autumn days. Whoever arranged the weather did a fantastic job! What a great week the Ladies Classic was, 3 perfect days. No wind Sunday, with a light breeze on Monday & Tuesday blowing from the North one day, and from South the other. Hearty congratulations to our overall winners Anne Barrow & Trish Anderson, winning by 4 shots over Patsy McDonic & Di Schlebusch. Anne celebrated her birthday by winning the Classic, what a way to spend your special day! Saluting what was a good week of golf! 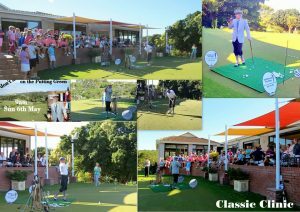 Thanks to Legends Players – Des Erasmus, Mel Davies, Richard Bridgeford & Deon De Beer for sharing your talents starting the party so well! 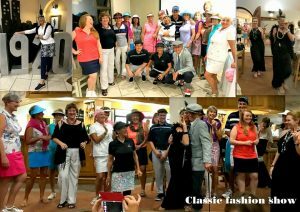 Saturday night’s highlight was the Southbroom Pro Shop Fashion Show. Well done to all the models, you all looked great! 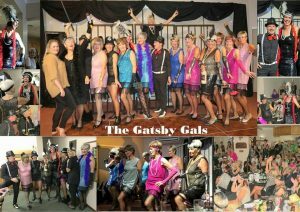 This years theme was 1920’s Gatsby, and once again it was embraced by all. Walking through the clubhouse on Saturday and Sunday night you would have thought you might have travelled back to the 20’s! The ladies all played their part, and looked simply fantastic. There was some stylish course fashion! Big thanks to Michelle Davies, Allyson Thomas & Irene Schanda who all put in a whole lot of effort and helped with the costumes, props and décor for the evening. Gavin’s staff of Brandon, Michelle, Tanith, Thembi, Wilson and all the bar staff put on a great show of delicious food and great service altogether creating a superb evening. Sunday, what a perfect day! Well Done to Charl and his team. The course was great, the weather near perfect, and the scoring didn’t disappoint. Eventual winners, Anne Barrow and Trish Anderson set the bar high on Sunday shooting 49 points. The sizable chasing pack of Liezel Van Achterbergh & Mariette Pieterse (46 points) Carol Dixon & Heather Evans, Marian Ledingham & Val McKenzie, Trish Amm & Mosa Le Roux Lindsay Owen & Heather Kruger all one further point back on 45 points. The slightest of breezes from the north was more than welcome as the predicted temperature from Monday was 33! 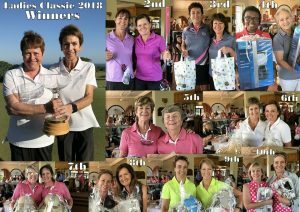 With the conditions good, the ladies again racked up the points, Rosheen De Kock & Bronwen Lambert, Sandy FitzGerald & Gill Huddy and Sue Van Der Riet & Wendy Huddy all getting 47 points. They all trailed the winners for the day, Patsy McDonic & Di Schlebusch by 1 point. 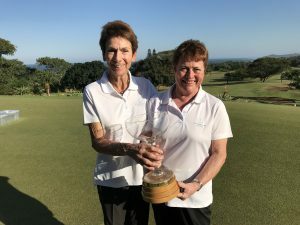 Patsy and Di’s 48 points made for an interesting final day as they had now pulled to within 2 shots of Tournament Leaders Anne Barrow & Trish Anderson to set up an exciting final round! Tuesday morning was again sunny, the cooling South West breeze very welcoming after the heat experienced on Monday. Gwen James and Heather Clarke seemed to welcome that slight breeze as they powered their way to a magnificent 51 points. Although a valiant final day effort, they could only manage 3rd overall. Anne and Trish had played consistently well over the course of the 3 days and managed to keep Patsy & Di at bay. Beating them by two points on Tuesday to win the Tournament by 4 shots. A big thank you must also go out to all our sponsors and especially those who manned their tees and spoilt the players! Thanks to active tee sponsors Realty 1 Southbroom, Coral Tree Colony, Sensasia, Trattoria Le Terazza & Lynne Blackstock! Well Done again to the hard working Ladies Committee and special thanks to Deanne Purtell (Dance Show Choreographer), to our Ladies Committee headed up by Michelle Davies, Allyson Thomas & Irene Schanda , and the rest of the Southbroom Ladies team for all the wonderful décor, enthusiasm and transforming the club house magically. Thanks to our handsome starters Mel Davies & Bob Thomas. Course Mafia Marshals – Tim & Roy! And efficient Registration Ladies Angela, Karen & Jean. Click here to be placed on the 2019 invitation list.